Today we look at the FS 455 folding lock Trelock more detail. In our test, we investigate this processing, the price, the weight, the handling in everyday life, the mounting and safety. Delivered, the bicycle lock in a plastic-cardboard packaging and can directly take a look inside the packaging to. Daily rate in the test: 59 euros on Amazon. The castle is situated comfortably in the hand and is from the feeling not just in a weight range on the go, in which combines the security positively with the weight. From the feel of the Trelock folding lock FS feels 455 high-quality. There is no rattling and no metallic noise.The individual members of the folding lock, six (6) in number, covered with plastic. This plated metal is prevented in paint touch the bicycle frame. Better than plastic would indulge a rubber coating. The joints are made of metal and make a stable impression us safe. Is the folding lock Trelock closed, it has a length of about 45 cm. The radius is just under 85 cm. More handling when closing follows the respective section. In addition to plastic and lots of steel is used in the production. Trelock used herein hardened steel alloys, steel TREDUR®. Particularly hard and particularly hard to crack, so it promises the manufacturer. The fixing unit is part of the delivery, is to buy peripheral thereto. Unlike the Abus Bordo Bigthe holder is fixed to the bicycle frame. 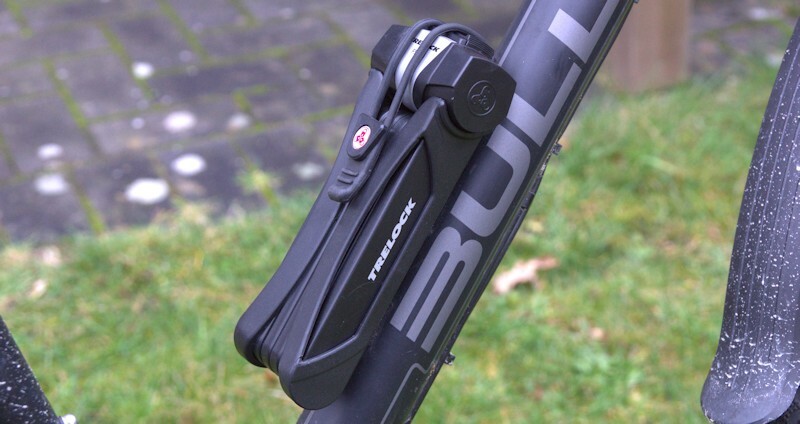 While one relies on Abus Velcro is attached With Trelock the support for the Folding with screws. This difference is then largely responsible for ensuring that you can not steal in a hurry the holder. The clamps are sufficient for attachment to frame with a diameter of 17 to 55mm (manufacturer information). In our test, we know how to install on pipe diameters of 35 mm and 45 mm without problems. Who would not be secured using clamps the Faltschloss or even, since the frame has a larger pipe diameter than 55 mm, for the has Trelock come up with something. Are the bolts for the bottle holder on the frame still free, so has the lock holder the opportunity to be fixed so. The screws to be also supplied by Trelock. On the Security scale of 1 to 6 with 1 being the lowest and 6 indicates the highest level of security, the folding lock FS 455 is a good level of 4 6. The Security Level (Trelock Security System) is defined by the bicycle based on the value. The more expensive the bike to be concluded, the greater the security level should be selected. If you want to insert the key into the folding lock, you first need a protective slide (dust cap) to move to the side. Unlike the Abus Bordo Big the lock cylinder is not free. This may just be quite practical in the winter, because as snow and ice can not make directly to create the cylinder. Dirt, water and other impurities are also held to get into the castle interior. As safety Note the manufacturer indicates that you should remove the lock from the bicycle, you want to transport it to a bike rack. At this point the message from us that we should do this with all loose attachments. If you register with its castle and key at myTRELOCK, template may be sent a spare key in the event of key loss. For this purpose, however, such account is mandatory. So if you can do without his bike a few days and the beloved lock Trelock FS 455 would not crack, the better use of this service. Here it is, at best register right after purchase. If you want to connect the bike to another, solid object which must zoom make close to this.The length of just 85 cm it has not so a big margin as a longer folding lock. Closes the bicycle itself is not a problem and very easy. From the rear wheel to the frame is not so far and here Trelock FS 455 is ideal to complete. The rotary head at the point where the last movable member in the lock engages , can it forms almost a circle and is very flexible when closing. An absolutely suitable for everyday use and compact folding lock with which one can protect his bicycle well and for less than 60 euros. By two methods of attachment, there is some thicker bicycle frame a chance to fix the castle, we find this very well and has brought to our judging slip corresponding points. In addition to its pleasant feel, especially the protection tab has convinced. The Trelock FS 455 might like to be more to our liking 10 cm or a limb, as we like to join our bikes sometimes to streetlights. The lock should provide sufficient security for the first 3-5 minutes. Does the folding lock is not open at this time of the potential thief, it may already be too risky for him. Does the bicycle thief time and is unobserved, so it may well have difficulties many a castle. Criticism for handling we can only relativize, certainly there is no comparison with a cable lock or a flexible chain, for that you get with the folding lock a legally secure bike lock . The safety effect on the weight and the handling is likely to be almost self-evident. Whoever compares a cable lock with a folding lock here, but also compares apples with pears. 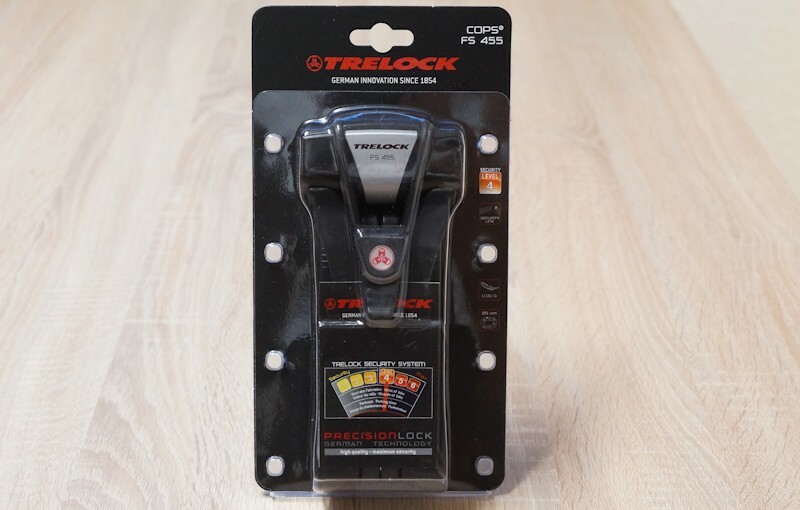 The Trelock FS 455 gets us 4.2 out of 5 stars, thus giving a clear recommendation. As with tests of other magazines and facilities it manages to convince the Trelock FS 455 in the test.